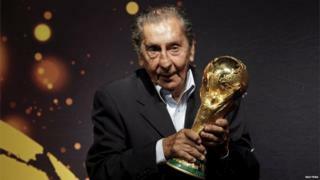 Legendary Uruguayan forward Alcides Edgardo Ghiggia, who scored the winning goal against Brazil in the World Cup in 1950, has died at the age of 88. Ghiggia scored the deciding goal 10 minutes before the end of the match in Rio's newly built Maracana stadium. The match, known as the "Maracanazo" - is considered one of Brazil's biggest footballing defeats. The last surviving Uruguayan player from the match, Ghiggia died on its 65th anniversary. Image caption The winning goal in the final game of the 1950 World Cup gave Uruguay a stunning 2-1 victory over Brazil. "It was beautiful what happened," Ghiggia said. "It filled me with pride and was unforgettable. The biggest moment of my life was the Maracana." When he turned 80 he was honoured by the Uruguayan congress. "Only three people have silenced the Maracana," Ghiggia once said, "the Pope, Frank Sinatra, and me". Image caption In 2009 he was asked to leave his footprints in a plastic mould at the Maracana to sit alongside the prints of other great players like Pele, Eusebio and Franz Beckenbauer.